All lit up for nighttime pouncing. 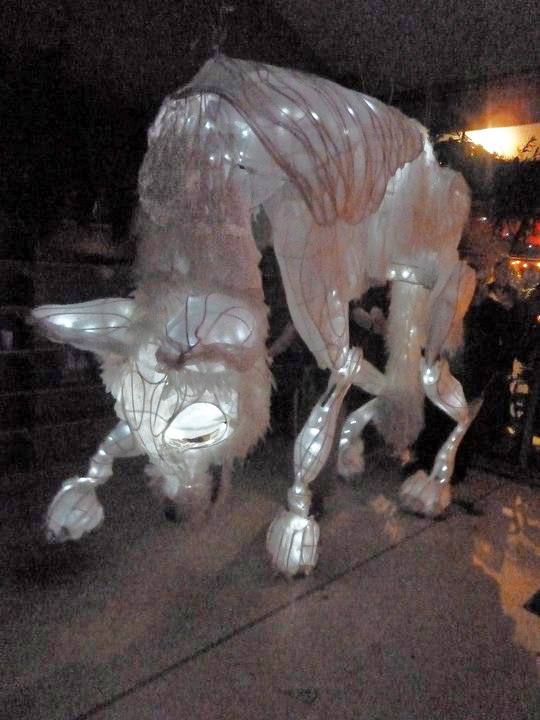 Dogody is an enormous dog made of reed, tracing paper, gauze, LED lights, and mail box carrier plastic. He is approximately twelve feet long and seven feet high. He requires three puppeteers to manipulate the head and handle the individual legs. Artist Sarah Lovett, created Dogody for the Solstice Parade in Seattle after receiving grant funding to support the cost of materials in 2010. Dogody has toured the region in galleries, nature festivals, and at other public events. In Giant Puppets Save the World, Dogody is a playful reminder to carry joy in our hearts in all that we do, to honor those that love us unconditionally and to cherish the inspiring support we receive from having animals in our lives.